The domain names of three of the largest online poker rooms that accept U.S. players have been seized by the FBI and shut down in the U.S., several sources are reporting. As of this morning, Friday, April 15, PokerStars.com, FullTiltPoker.com, UB.com and Absolute Poker (both part of the CEREUS network) are now off-limits to visitors from the United States. obtained by the United States Attorney’s Office for the Southern District of New York and issued by the United States District Court for the Southern District of New York,” the message reads. “Conducting, financing, managing, supervising, directing, or owning all or part of an illegal gambling business is a federal crime. 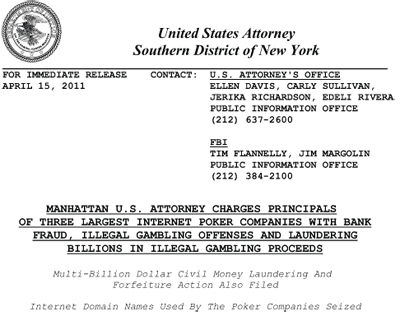 “For persons engaged in the business of betting or wagering, it is also a federal crime to knowingly accept, in connection with the participation of another person in unlawful Internet gambling, credit, electronic fund transfers, or checks. The U.S. is also filing a civil money laundering and in rem forfeiture complaint against the companies, “their assets, and the assets of several payment processors” they use. “In addition, restraining orders were issued against more than 75 bank accounts … and their payment processors, and five Internet domain names,” the news release continues. >>> Read the FBI’s news release here. The online gambling industry has been caught off guard by the FBI’s move. So far, the authorities are working their way through domain name servers, so not all regions of the U.S. are affected — but that should quickly change. Some Canadians and UK residents are reporting seeing the confiscation warnings as well, while many in the U.S. are still able to access the sites. But it’s to be expected that the seizures are just beginning, and, over the course of the next week, the U.S. government’s full plan will come into view. The timing of the message is certainly interesting, given how close some U.S. states are to regulating online gambling, and the fact that D.C. has confirmed plans to do so. Stay tuned to the Casino Affiliate Programs Blog for updates on the situation. 1) There will be more seizures/prosecutions. 2) This is a precursor to full U.S. regulation. This is bad for my site. I host a site that i give poker dollars/freerolls for points awarded by taking surveys. There WILL be other poker rooms who will gladly work with you, so it might not be the end of the world for you and your website. I will suggest you to get into the European market where all the traffic of the poker rooms mentionned above are redirected to, good luck !!! This is definitely linked to Daniel Tzvetkoff. “Federal authorities also froze approximately 76 bank accounts in 14 countries that contain proceeds from the alleged offenses” – for this to happen… someone had to know the location of the accounts. Rak, I fully agree with you. It’s simply not possible to know the name, location, and account numbers without having insider knowledge and only a payment processor would have this know-how. The heavy-hands (and wallets) in vegas are getting their own way just as they always have. It would have been silly to expect them to lose all their business. It is because the USA in cahoots with the City of London are the biggest criminal enterprises on the face of the earth. It has nothing to do with regulation & everything to do with control and money. The financial elite were a bit slow of the mark when it came down to the internet. So they couldnt fully control all aspects of it. Now they are using the government (which they control) to steal back the internet under the guise of “regulation”.. When in fact it is just an oligarchical take over of the freedoms that the internet has. Well said Gaz. Couldn’t agree more. I wonder is the US goverment is going to introduce state owned online poker sites for US players, like what Australia do with land based casinos. Yes, in fact, I believe today’s news about the .com domains being reinstated indicate that regulation is coming sooner rather than later on a state/federal level.